To those familiar with Anitay, it is known that any and all writing for this site is done to try and satiate the avarice of the pagan cat god, Dexomega. Interminably beset with rage at the proliferation of bad anime that is not Cowboy Bebop, we try in vain to temporarily quell the ferocious outrage by sacrificing lists of high quality anime at His virtual altar. The following anime represent Nomadic Dec’s futile attempt to provide Dexomega and his disciples temporary respite from their self-flagellating torment by distracting them with his favourite anime that aired in 2015. To qualify, the anime series must have have completed its run this year. This list will include series that began in the Autumn 2014 and had their final cour in 2015, because endings are important. This list is obviously not exhaustive, because I haven’t watched everything, and omits JoJo because not even Dexomega could survive the wrath of DIO (also, I’m behind). They are not ranked; they are just great and listed alphabetically according to my inconsistent title usage. Garo: Honoo no Kokuin or Garo: The Good One. Yes, the first animated season of Garo is worth your time, following the escapades of father, Herman, and son, Leon, as they attempt to rid the world of Horrors. Their travels lead to encounters with the wonderful Ema Guzman, whose wit lends itself to the brilliant dialogue that complements this rollicking adventure. The series balances emotional subtlety and exciting action artfully with its frankly beautiful animation. Kekkai Sensen is another series with a memorable soundtrack. That is, however, the tip of iceberg. Renowned for having a finale that took four months to air, the series was worth the time and effort Bones put into it. Frenetically-paced, the episodes shift in theme and premise drastically from episode to episode. There is beauty in the chaos and each episode unfolds deliberately. You could probably watch each episode independently and still find yourself laughing and in awe of the places the series takes you. It’s a great emotional pick-me-up and one of the few series with which I would recommend the dub over the sub. Seriously, the dub captures the characters fantastically. My Romantic Teenage Comedy SNAFU TOO! doubled down on the emotional turmoil this season compared to last, with the comedy aspect of the title giving way to drama of the best kind. Poor Hikki finds himself in a quagmire and while his acerbic commentary is en pointe once again, the ever-growing number of women in his life take centre stage, as Hachiman’s reluctance to change forces their hands in devastating ways. Thank god for Iroha providing levity with her flakiness and self-absorption (EDIT: Are you satisfied Morie? :P ). Do yourself a favour and watch SNAFU for a shot of social realism in time for the New Year. Noragami Aragoto ascends into the realm of the gods and in doing so becomes the psychologically complex thriller series that the first season promised. The balance of action and comedy is retained from the first season, but delving into the mythos behind Yato and company uncovers interesting moral dilemmas. One Punch Man is the tonic for superhero over-saturation and fatigue. Saitama’s apathy towards superheroism is as invigorating as it is hilarious. If you can’t be bothered to trawl through Anitay’s Beginners Guide to Anime (hint hint), start here. In fact, scratch that, everyone just witness the glory of this overpowered, blank-faced superhuman. Ore Monogatari is the love story that puts most other shoujo to shame. 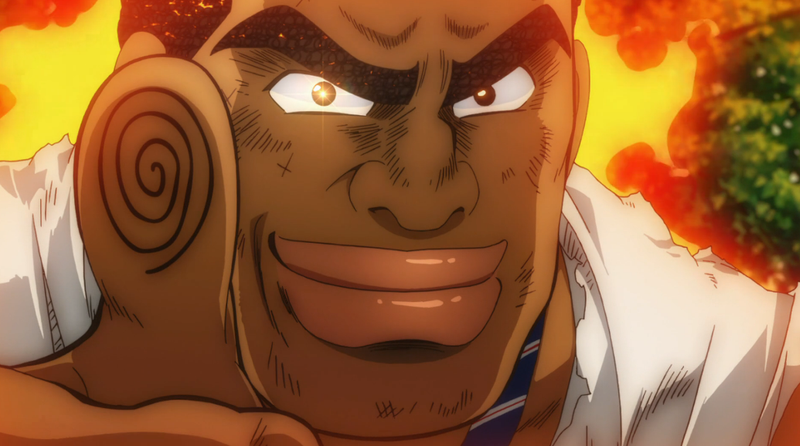 Takeo is a hilarious and upstanding leading man for the ages, but really Suna is perfection. It’s the series that will leave you feeling warm and happy after each episode, with a story devoid of unnecessary angst, full of couple growth, and rife with characters that actually talk to one another. Parasyte: The Maxim is one of several Madhouse offerings on this list, and this adaptation updates the artstyle to match the thematic complexities presented in the original manga. While Migi’s consternation (perhaps that isn’t the right word, he doesn’t feel) at Shinichi’s human fallibilities is always interesting and entertaining, Tamura Reiko presents the physical embodiment of Parasyte’s dilemma and elevates the series considerably. If nothing else, watch for her. Shirobako was probably my all-around favourite anime of the year and one of the most satisfying I have seen. For a series devoted to expounding every facet of the anime creation process in meticulous detail, the series has some of the most compelling characters written, charting the trials and tribulations of our protagonists in an engrossing and emotionally involving manner. Aside from the genuinely hilarious dialogue, no character is left without an arc, and you will find yourself cheering when members of the extensive supporting cast appear (except Tarou). May this be the series P.A. Works breaks their format with and gives a second season to. Subete ga F ni Naru: The Perfect Insider is a series I enjoyed mostly because of the speculation it engendered. It is a well-crafted mystery, and the clues are delivered from the beginning. It is a series that elevates one’s sense of Holmesian prowess. The hours-long post episode dissections were just as fun as the episodes and OP, so grab a friend, and begin sleuthing. Active Raid: Stepping out of the shadows of adaptation, Production IMS releases their first original series under the auspicious direction of Goro Taniguchi, director of Planetes and Code Geass. The series follows a special exoskeleton-wearing taskforce sent to combat crime in downtown Tokyo. Ajin: Demi-Human is a seinen manga adaptation. Following the discovery of immortal beings present in society, scientists begin hunting down and performing macabre experiments to determine the cause. A teenager, Kei, finds himself imbued with this unlucky ability. The manga also has films being produced so the marketing team is confident. Dagashi Kashi is the tale of Shikada Kokonotsu, reluctant heir to a rural sweetshop. Although Shikada wants nothing more than to become a manga artist, he faces an unexpected hurdle when an unusual girl comes to town hoping to commandeer the Kokonotsu family expertise for her own company. Shikada’s father promises to join her business, but first she must ensure Shikada will run the sweetshop after he’s gone! Dimension W is set in 2071, where the energy crisis has been solved by a tapping into a seemingly infinite source, the eponymous Dimension W, through electric field inductor coils. Kyoma is an agent trying to curb illegal usage of such energy fuelled by his own aversion to the technology. He is forced to confront this mistrust when he comes across Mira, an android who is powered by the coils. Haruchika: Could this be the series begin a year in which P.A Works breaks their recent curse of one great series and one lacklustre series per annum? This series shows promise, combining music and mystery. Haru and Chika are members of a woodwind instruments club that is about to be closed. When they come across a suspicious incident, they take it upon themselves to investigate, while still saving the club. I hope this list has been of some use in furthering your anime adventures. Enjoy your travels!